This post begs one of two questions: ‘How many ways can I make kale salads?’ and ‘How many ways can I add butternut squash to salads?’. To answer the, first, there’s this kale salad with apples and craisins, kale and shredded brussels sprouts salad, and this marinated kale and green bean salad, to name a few. And when it comes to butternut squash, I’ve put a Mexican spin on it, with black beans and rice, tossed itwith a tahini dressing, and mixed it with olives, apples, and feta. It’s obvious they’re two of my favorite salad ingredients, so it was only a matter of time until I put them together! This makes a large salad portion—probably enough for 6-8 if you’re serving it as a side dish. Granted, four of us finished it off (and I probably ate 1/3 of it!). The dressing is simple (lemon juice, olive oil, salt, & pepper), but you don’t need anything fancy because the roasted squash, roasted red onion, and feta add plenty of flavor on their own. If you’re eating it as a main dish for lunch or a light dinner, bulk it up with some toasted and chopped walnuts, pecans, or hazelnuts! 1. Preheat oven to 400F. Line two baking sheets with aluminum foil. Toss squash and onion with 3 tbsp of olive oil. Lay out over baking sheets and season with salt and pepper. Roast for 30-40 minutes, until onions and squash are tender and browned. 2. In a large salad bowl, combine lemon juice, remaining 3 tbsp olive oil, 1/2 tsp salt, and a pinch of pepper. 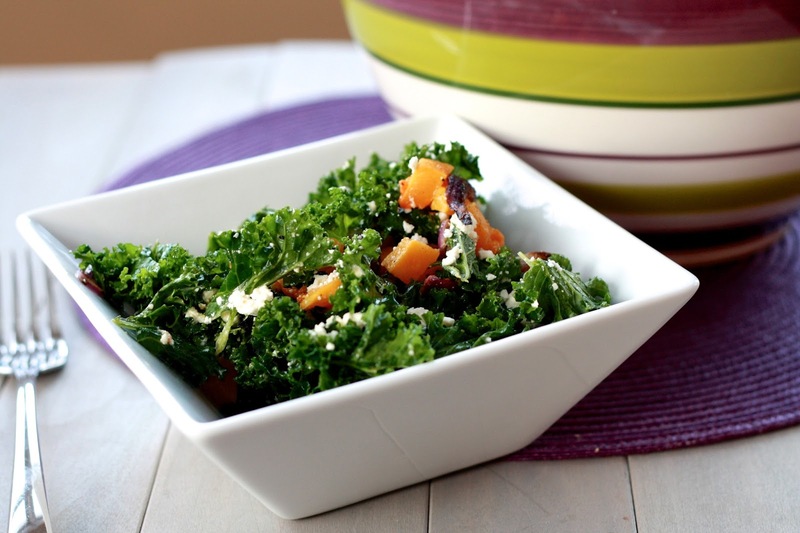 Add kale to bowl and toss with your hands to coat kale in dressing. Allow to stand for at least 30 minutes. 3. 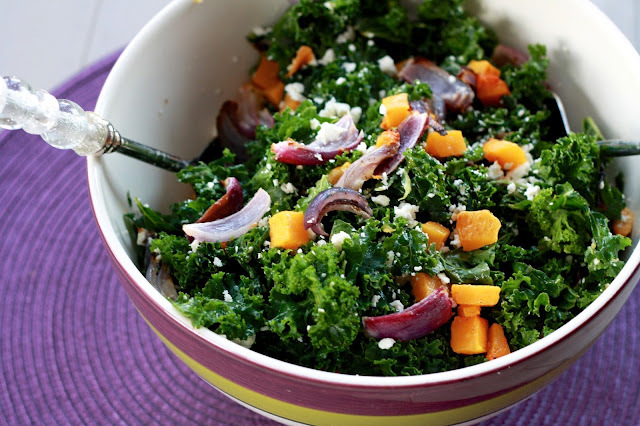 Toss squash and red onion with kale and feta. Serve immediately.